The Seat badge from the Volkswagen group needs no introduction. The brand has commendably established itself in this moving time. After recently unwrapping the Cross Sport Concepts and 20V20, company took the curtains off its Seat Ateca 2017. The model brings with it better looks and a diverse engine lineup at an affordable price. 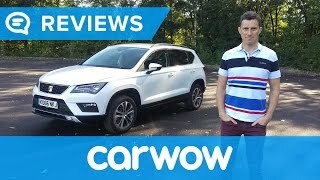 Let us have a look at the review of Seat Ateca 2017 to know in detail about it. The interior of Seat Ateca 2017 is very much alike it’s Leon sibling and this is one thing that might disinterest you. The similarities include the center console, dashboard A/C vents design and the steering wheel. However there is lot of space to grab your interest. The interior is much roomier in comparison to its sibling. It has raised seating position with lots of legroom and headroom. 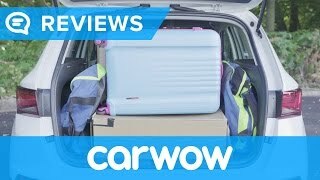 Talking about the cargo space, the model offers approx. 500 liters (average) of luggage room. Getting to the technology integrated, it has the new Easy Connect infotainment system with Seat full Link, Connect App, wireless charging, Android Auto and Apple CarPlay. The above listed features work through an eight-inch screen and can be operated through center console. 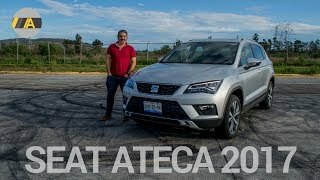 Thus rounding up the interior details of Seat Ateca 2017 I would say. It has space and technology both that make it distinct from its predecessor. 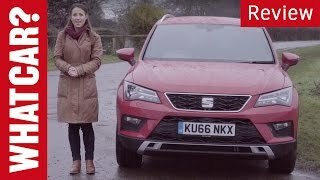 Just like the interior, exterior of Seat Ateca 2017 carries its design hints from the Leon Sport sibling. However I personally found it bit more attractive with its short height and little extra features. Starting with the front fascia, it has the similar grille sitting amidst the borrowed headlamps. However latter gets new LED pattern and the mesh that makes it more attractive when compared to the sibling. Beneath the setup we have a massive trapezoidal air intake delivering fresh air to the engine while the fog lamps on either corner get a roguish surroundings adding to the aggression created by the headlights and air duct. At the rear fascia we have a twin exhaust configuration mounted below while the taillights resemble the looks we recently noticed in the lineup. 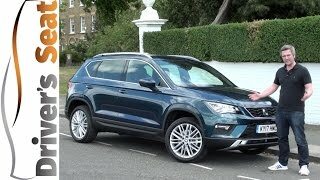 Thus rounding up the exterior details of Seat Ateca 2017 I would call it as a blend of little more aggression added to the traditional design theme. Beneath the hood of Seat Ateca 2017 will be four engine variants. First is a 1.0 liter three-cylinder engine cranking total output of 113 hp while second is a 1.4 liter rated at 148 hp. Both the above variants are TSI. For the diesel lineup we’ll get a 1.6 liter with 113 hp or a 2.0 liter four-cylinder producing 148 hp or 187 hp. The performance figures of Seat Ateca 2017 are still to come and we expect them to be around by the April Auto Show.